A peaceful winter scene - or is it? 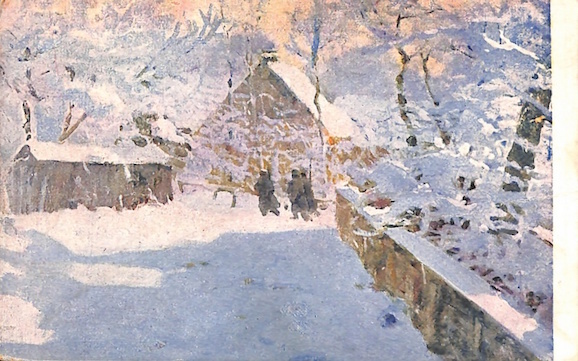 This postcard at first looks like a quiet winter scene. One can almost imagine the bright light and deep silence right after a snowstorm. The strong diagonal of the fence on the right side of the composition draws the eye to a small group figures in the background. Are they villagers? Perhaps Christmas carolers? They're not. The back of the postcard indicates that this is a painting by the well-known Ukrainian artist Osyp Kurylas (1870-1951) entitled "The Changing of the Guard" ("Зміна варти"). It was published nearly one hundred years ago by the Central Council of the Ukrainian Sich Riflemen ("Центральна Управа Українських Сїчових Стрільцїв" in the spelling of the time). The figures are not carolers. They're soldiers. In 1914, World War I exploded. Ethnic Ukrainian men were conscripted into both the Austro-Hungarian and Russian Imperial armies, and faced off against each other on opposite sides of the front lines. With revolution brewing in Russia, Ukraine took advantage of the situation and declared autonomy within the post-Revolutionary Russia of 1917, then full independence in 1918. This declaration resulted in the Ukrainian War of Independence, in which the newly-formed nation fought a losing battle against a bewildering array of enemy forces, including Imperial Germany and both the Red and White Russian armies. The Sich Riflemen ("Sichovi Stril'tsi") were an infantry battalion formed in 1917, and were one of the first regular units to fight in the war. Kurylas joined the Riflemen as a volunteer early in the war. Given his professional training at the Kraków Academy of Fine Arts and his accomplishments as an artist, he became the head of the art department in the battalion's press service. He and his team generated propaganda artwork and postcards which celebrated the exploits of the Sich Rifles for distribution among Ukrainians and Ukrainian immigrants in the United States, Canada, and elsewhere. After the war, he continued to live in what is now western Ukraine under Polish and then Soviet rule, where he worked as an illustrator, created religious art, and near the end of his life adopted the officially approved Soviet style of Socialist Realism. 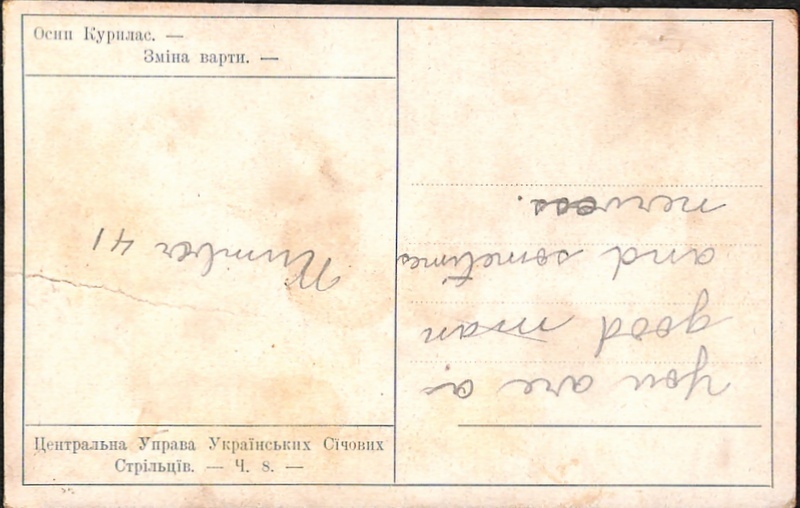 This particular Kurylas postcard from the time of the War of Independence happened to end up among the papers of Fr. Gregory Chomicky, whose archives are part of the Center's permanent collection. Fr. Gregory was an immigrant from western Ukraine living in Chicago at the time, and was likely following events in his homeland very closely. He may have obtained this card from a Ukrainian American organization or retailer in the U.S., or from a friend or family member in Ukraine. In any case, it clearly was never mailed as a postcard (though it does have the strange and incongruously comical inscription "You are a good man and sometimes nervess [sic] / Number 41"). Nearly a century later, Ukraine today is entering another winter of a war which again threatens its independence. We pray that this war ends soon, and with a more positive outcome.